December 20th (The day before the day the olde world ends…) at 7:06 pm sharp! There will be laughs, refreshments, and a good time to be had by one and all. As has been our long-standing holiday tradition, the Emcees for the evenings will be Santa and his helper—and, as in the past, leave the kids with grandma! SOLD OUT! SORRY--BUT COME TO OFF CENTER ON DECEMBER 14 OR 15 TO SEE ALEXA LUTHOR PERFORM IN A VERY OFF X-MAS (see below)! Green Mountain Cabaret, Vermont's hottest new neo-burlesque variety show, is putting on its inaugural production at Off Center for the Dramatic Arts' stage on Saturday, December 8th with two shows- 8pm and 10pm (18+)! Green Mountain Cabaret is the brain-child of Chicago burlesque sensation and Vermont native, the "Kryptonite to Clothing," Alexa Luthor. She and the Sugar Shakers are bringing cabaret into the 21st century with a flash of legs, lyrics, and laughs. 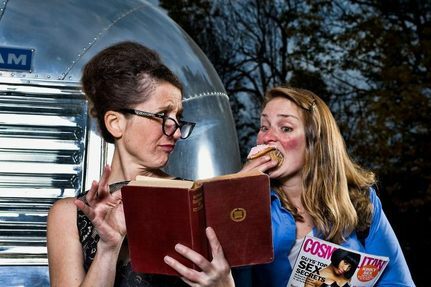 While sensuous sizzle is the main attraction, the hosts will round out the girls' ranks with local Vermont talent including stand-up connoisseur Dustin Bruley, People with Faces Improv, and many more! Glitz, Glamor, Guffaws, and more abound in this cabaret that reminds you how fantastically fun burlesque can be. Green Mountain Cabaret will warm the cockles of your heart (and other areas) this December at Off Center for the Dramatic Arts. And remember, when you visit Green Mountain Cabaret, "Enjoy the View!" Tickets: SOLD OUT! 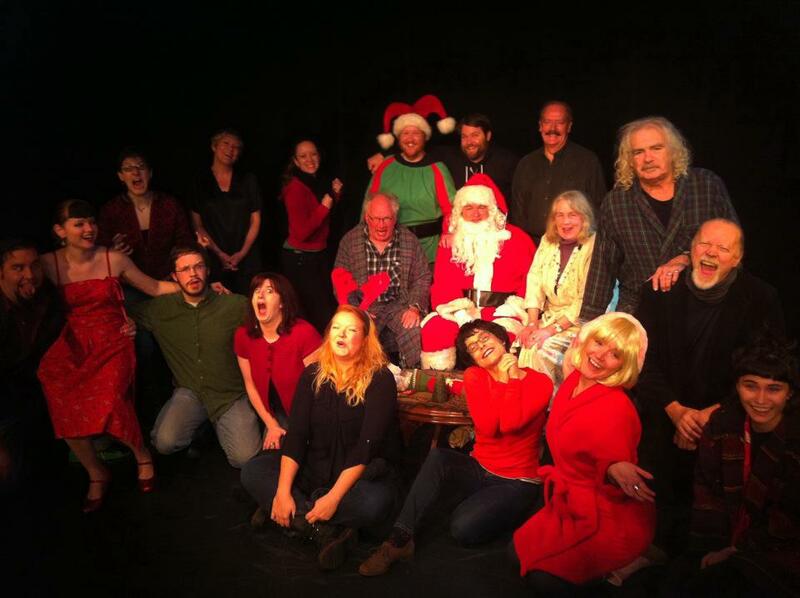 SORRY--BUT COME TO OFF CENTER ON DECEMBER 14 OR 15 TO SEE ALEXA LUTHOR PERFORM IN A VERY OFF X-MAS (see below)! Where do words 'live' in the body? How can we get away from stereotypical gestures on stage? How can we improve upon our physical relationship to the text? This workshop addresses some of these questions and explores our physical relationship with words. We will examine the ways in which increased physical freedom further connects the actor to his/her words and brings about a greater truth. A starting-off point for actors of all levels and a different way to encounter text that is useful in preparing for an audition, a role or working on a monologue. A playful, full-bodied exploration that leads to a greater sense of ownership and confidence with the text. As an acting instructor Craig has taught classes, workshops and served as a guest artist with Yale University, Middlebury College, St. Michael’s College and Flynn Center for the Arts to name a few. 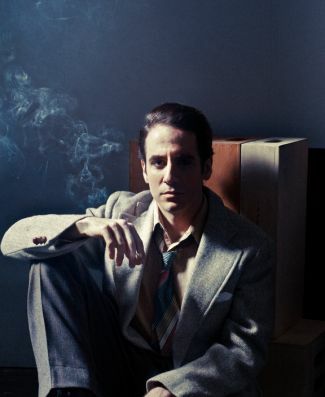 He holds an MFA in Classical Acting from The Academy for Classical Acting at The Shakespeare Theatre / GWU. 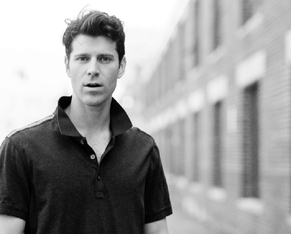 His training includes work with some of the nation’s leading teachers of Shakespeare, acting, voice and movement. 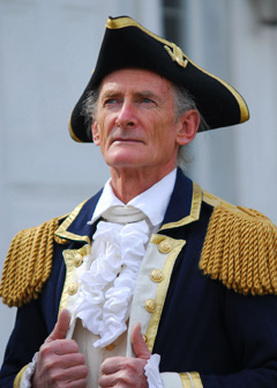 Craig is a proud member of Actor’s Equity Association for over 8 years and his theatre credits include work with: The Kennedy Center, Long Wharf Theatre, The Shakespeare Theatre, Washington Shakespeare Co., Elm Shakespeare, St. Michael’s Playhouse, Bread Loaf Acting Ensemble, Vermont Stage Company and several others. November 16 & 17, 2012, 7:30 p.m. Following his debut at Off Center for the Dramatic Arts in September, storyteller and actor Dennis McSorley returns November 16 & 17, performing his newest work, Who Made Me? A long time presence over the years in Vermont productions, he has played memorable roles in works written by established playwrights including Miller, Stoppard, Chekov, Simon, Mamet, Albee and Vermont playwrights Steve Goldberg, Keefe Healy, Maura Campbell and Jim Lantz. “Found myself nodding ‘yes’ and grinning ear to ear." “So many opportunities to pause and reflect on big issues close to the heart." Who Made Me? looks at doubt, risk, confusion, faith and fear told by someone who has experienced all of these feelings and hopes to touch something in everyone by asking questions and not really answering them. Performances are at 7:30 p.m. Tickets are $10 and are available at the door (cash/check only). A dark and quirky view into the global financial crisis, and those who pick it’s bones. Join Olivetti, Charlene, Stone, and Daniels as they sift through a sea of lives, litigation, and libations, looking for the biggest “fish.” Proudly sailing through the wreckage of the financial crisis, their captain having sailed for safer waters, this dedicated crew scours the waves for survivors with a few pennies in their pockets, which are surely owed to someone else. 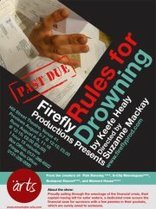 "Keefe Healy's play plunges us into the dirty world at the heart of the recession, the agents who "work" bad debts. It's a savage world, where rules are negotiable and "every predator is someone else's prey". The agents struggle to distance themselves from the desperate people at the other end of the line, while frantically bailing water from their own sinking ship.…..an ambitious and timely project. Curtain is 8 pm, and tickets are $15.00 available at the door (cash/check only). 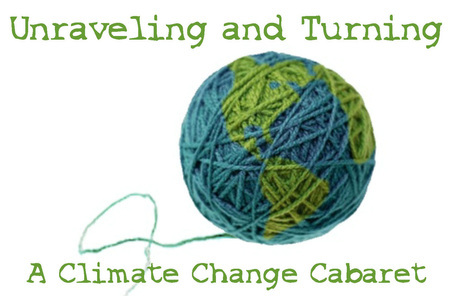 A Variety Show addressing climate change and everything it implies: from changing behaviors and transforming systems to exploring the nature of loss and change to re-imagining our collective future. With Jen Berger, Kathryn Blume, Cami Davis, Lyndsay Love, Linda Patterson, Sonia Plumb, Josh Schlossberg, and Phinn Sonin. For more info contact Jen at jb4pax@yahoo.com, or click HERE to go to the Salmagundi Facebook page. Contact: Instructor, Carole Zucker. E-mail address: info@actingworkshops.info (Click HERE to visit the Workshop Web site). If you drop Carole a line, she will be more than happy to discuss the technique in more detail. The registration form is on the Website. Sanford Meisner formed the Neighborhood Playhouse in New York City, long considered to be one of the finest acting schools in the world. Meisner created a technique that develops the actor’s instincts, sharpens their sensitivities, and enriches the actor’s most important tool, their imagination. The technique begins with “the repetition exercise,” a deceptively simple improvisatory exercise based on listening and responding to your partner in the moment. In each class, different elements—circumstances, character and location, and the performance of various “activities” (such as handling objects) are added to the basic structure of the exercise. Meisner work is an excellent technique for increasing an actor’s spontaneity, essential to actors working in any medium—film, theater and television. The technique also eliminates self-consciousness, which is helpful both as an actor and in your life. You do not need experience as an actor to take this workshop, just a sense of commitment to the process. 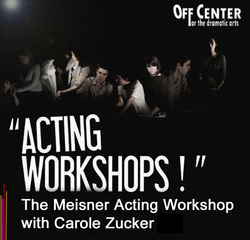 Carole Zucker has been called “The Foremost Acting Teacher” (Montreal Mirror). She has taught Cinema Studies at Concordia University (Montreal, Canada) for over thirty years, and her area of expertise is performance. Carole was the first university professor in Canada to design a course specifically devoted to film acting. Carole is a trained actor, having studied at The Neighborhood Playhouse, and with Uta Hagen at the HB Studios, both in New York City. She has performed in numerous off-off Broadway productions and in regional theatre throughout North America. Carole has taught private acting workshops since the 1990s in Montreal to great acclaim and full classes. She has recently moved to Vermont where she is continuing her workshops, and has previously taught a workshop in Burlington on the Meisner Technique and a course on Scene Study at the Flynn Center for the Performing Arts. Performance, a collection of actor interviews (Heinemann Drama, 2002). Zucker published The Cinema of Neil Jordan: Dark Carnival with Wallflower Press (London, 2008), and her book Interviews: Neil Jordan will be coming out in the Spring of 2013, and will be published by The University of Mississippi Press. She is the winner of numerous arts grants from the Canadian government for her work on performance. From silly to satirical, pithy to profane, experience the tsunami of sketch comedy that is Stealing from Work. Written by Angie Albeck and Marianne DiMascio, this fast-paced event pays homage to the traditions of sketch while remaining firmly planted in the culture of Vermont. The acting talents of Chris Caswell, Kevin Christopher, Marianne DiMascio, and Geeda Searfoorce are on full display, each playing over 15 characters throughout the performance. Robin Fawcett has joined this crew of rowdy women (and a few men) to direct the irreverence and wrangle the effusive talents. All tickets $15.00, available online and in-person through FlynnTix (Click the button below). Tickets will also be available at the door for cash and check. Waterfront Video is the generous sponsor of Stealing from Work. They have EVERY awesome DVD ever made. And if you are jonesin' for a little more Stealing from Work, check them out on Facebook. During the Revolutionary War, and after the battles of Lexington and Concord, Ethan Allen captured Fort Ticonderoga in May 1775. This was the first fort taken by the Americans. On September 24, 1775 in Montreal, Canada, Ethan was captured and kept on British prison ships. The British barely kept him alive, then two and a half years later he was exchanged for a colonel and was set free. - Sarah Dopp, Vermont Historical Society President. - Dave Lewit, editor: Boston/Cambridge Alliance Dispatch. -Dr. Thomas Naylor, Second VT Republic. All tickets $8.00, available at the door (cash or check only). "The Comedy of the Year. A haunting and hilarious new play. Mr. Lindsay-Abaire is an expert at tweaking, skewing and finally inverting established formulas. His plays tend to slide right out of predetermined pigeonholes. KIMBERLY AKIMBO is at once a shrewd satire, a black comedy and a heartbreaking study of how time wounds everyone." —NY Times. Funny and off-beat, this dark comedy revolves around 16 year-old Kimberly Levaco, a teenager with a rare condition that causes her body to age faster than it should, forcing her to re-evaluate her life while dealing with her highly dysfunctional family, her impending mortality, and a final chance at first love. Starring Noni Stuart, Andy Butterfield, Cael Barkman, Dawn Kearon, and Tyler Ogden. Performances are Fri. through Sun., Sept. 28th-30th and Oct. 5th-7th at Off Center for the Dramatic Arts in Burlington. All shows begin promptly at 7:30 p.m.
Tickets are $15 at the door (cash/check only); credit card customers, please click the button below to purchase in advance. OHIO, REVISITED is an exhilarating, hour-long tale of four siblings in rural 1950s America coming of age and weathering the tragic trials of their time. As soon as one sibling's heart starts to rumble, so do all the rest of the hearts. As soon as one leaves home, it's only a matter of time a'fore the others leave, each in her own time. Ultimately they're bound by something that lets them know who they are. When they go away, that binding gets lost. When they come home, it tightens up again like a knot in the rain. A brave and spirited exploration of living and loss, OHIO, REVISITED is an unapologetic piece of experimental theatre. The story unfolds through a striking mix of poetic text, meticulous physicality, and transcendent original music. 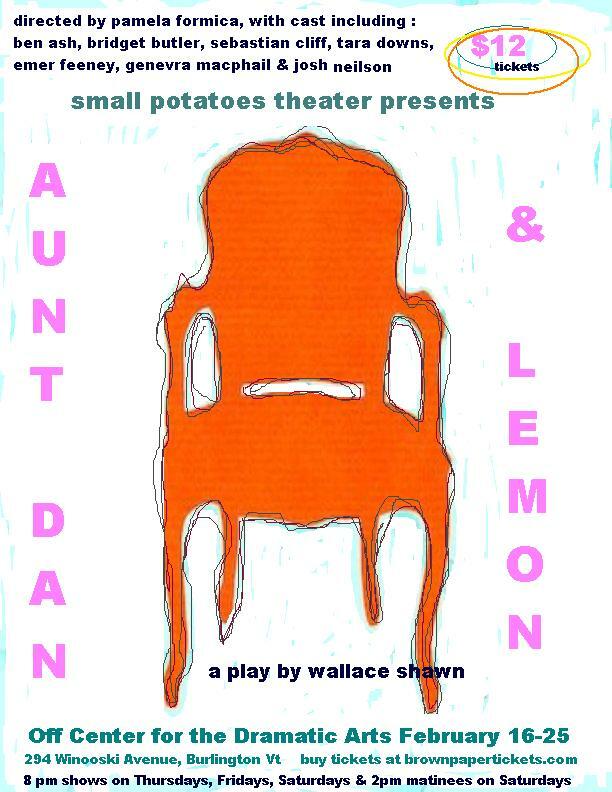 Originally titled What Happened in Ohio, the piece was developed over a year and a half and had its inaugural production at the New York Theatre Workshop 4th St. Theatre in May 2011. Afterwards, The Roadsters took on a radical re-imagining of the material in order to hone its originality and make it shine, going much deeper, thematically and theatrically, into the world of the play. The Roadsters have been invited to present the reimagined version at the Off Center in Burlington, Vermont August 22-25. 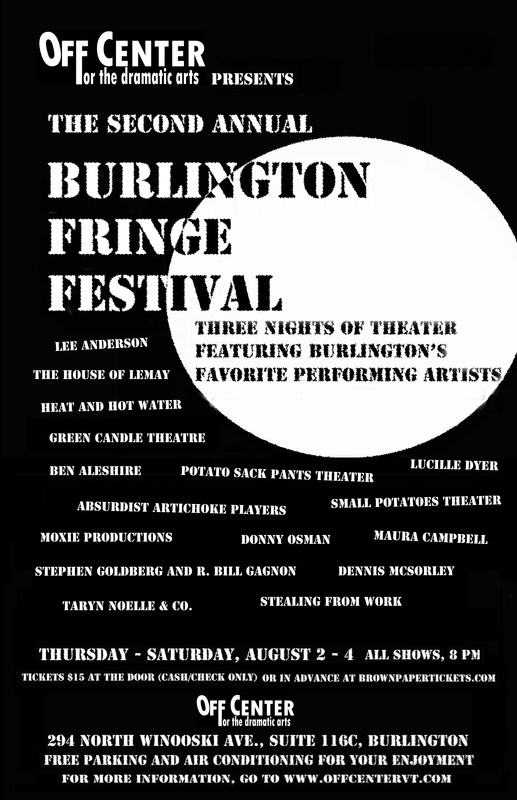 The members of Off Center are grateful to the performers and technicians who have donated their talents to bring you the Second Annual Burlington Fringe Festival, a celebration of Burlington theater art and of this unique and intimate venue. Vermont Teen Theater (VTT) is proud to present the return of fast paced, slapstick comedy The Complete Works of William Shakespeare (Abridged) by Adam Long, Daniel Singer, and Jess Winfield. 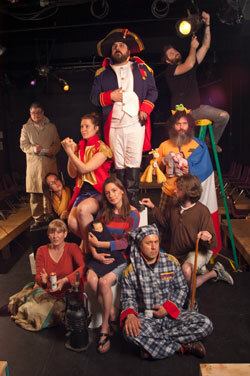 This parody is a bold and irreverent romp through all of Shakespeare's plays in less than two hours. VTT was founded to be an outlet for Vermont youth to learn about all of the different aspects of theatre. Since VTT's founding, the group has produced four shows: A Midsummer Night's Dream, The Suessification of Romeo and Juliet, Dr. Horrible's Sing-Along Blog and The Complete Works of William Shakespeare (Abridged). Vermont Teen Theater (VTT) is a Youth run theater group founded in Rochester, Vermont in 2010 under the direction of mentors from the White River Valley Players. Anyone interested in joining the fun should contact Vermont Teen Theater member Marissa Achee at marissaachee@gmail.com. Note: may not be appropriate for very young children due to some language. Tickets: $10 adults, $7 for kids, available at the door. Anwar Ensemble was formed in 2012 to bring the classical and popular music of the Middle East to a wider audience in the North Country of New England and New York. The group’s leader Syrian violinist, oudist and composer Anwar Diab Agha played for many years with the Syrian National Radio and Television Orchestra in Damascus and has toured internationally with some of the best known musicians in the Arab world . Since moving to this country to join his family he has continued to compose new works which are a unique feature of the group’s repertoire. 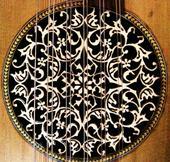 Anwar, which means “luminous” in Arabic, accurately reflects the style and substance of this ages-old tradition of music. Members of Anwar Ensemble include: Greg Allison, violin; Peter Bingham, oud; Jeffrey Davis, oud; Colin Henkel, doumbek; and Gabriel Shapiro, bass. Anwar Ensemble hopes that this music, still new to audiences in North America ,will further cultural diversity and tolerance by uniting those who hear it in a desire to better appreciate and understand the tradition from which it comes.